We have a refreshed brand and an exciting new website! Solution IP are extremely excited to announce the launch of their fresh new brand appearance and their new, user-friendly website. We’ve changed a lot since we were founded in 2006. We’ve grown as a company, developed relationships with many loyal clients within the Southwest and across the UK, and added to our in-house team of business communications professionals and engineers. As we look to the future, we are aware that the world of Business Communications is always evolving. To that end we hope to continue to grow and evolve ourselves, as a trusted business communications supplier on a local, national and even global scale. We aim to develop our service portfolio whilst continuing to offer nothing but the highest standards of customer service to our clients, both existing and new. With this in mind, we thought it was about time our brand reflected our ambitions, and we have spent the past weeks working with Bristol based design company YZ Designs to come up with a new logo and brand appearance that is fresh, modern and professional. 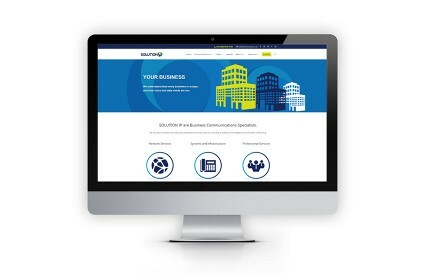 As part of this process we are re-launching our website, which, apart from having a clean and colourful new look, is now much more focussed on explaining how our three core service sets of Network Solutions, Systems and Infrastructure, and Professional Services can help you as a business to achieve your goals. We are also proud to announce our updated Mission Statement and our core values, signalling a clear commitment to our customers and their care. The aim of this web launch is to make sure you understand more about who we are, what drives us, and how we like to work. Our philosophy of Your Business, Your Journey, Your Solution, Your Partner is also clearly set out on our new site. We want all of our customers to have a positive customer experience with us, and our 4 Promises make sure each and every client feels valued. Moving forward, we intend to continue adding material to our website on a rolling basis, particularly our resources section, which we would like to fill with useful white papers, how-to guides and infographics to further demystify some of the more complex themes of communications. Feel free to let us know what you think by emailing info@solutionip.co.uk.